My friend and fellow low-carb writer, Mellissa Sevigny, asked me to share this special deal with you; she is offering her e-book, The Gluten Free Low Carber, for FREE on Amazon. It is available Sunday, August 25th, for 24 hours only. Sales ends at 11:59 PM (Pacific time). 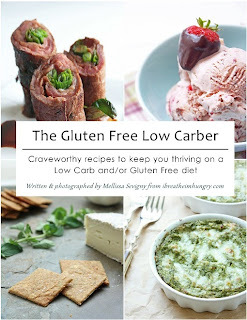 e-book, Mellissa Sevigny, The Gluten Free Low Carber. Bookmark. "Diabetes Health" Article About "Carb Wars"
"NOURISHED" NOW AVAILABLE ON KINDLE AND NOOK! AMAZON PROMOTION: SPECIAL PRICE ON "NOURISHED"